The summer of 1991 once again found the band with time on its hands. Manitoba’s Wild Kingdom had been dropped by the geniuses at MCA, the Del-Lords had broken up, and our heroes were left with the choice of scattering into the wind (again) or putting the band back together. To quote Manitoba, “We could stay home for the summer and lose money, or go on the road and lose money.” So, in best DIY, 3-to-a-room-at-the-Motel-6 fashion, the road was the choice. 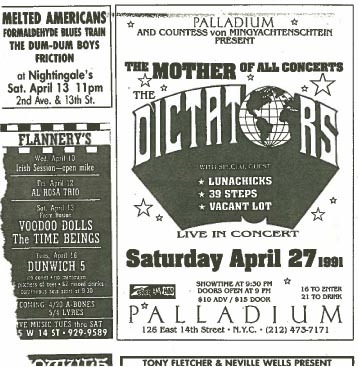 The Dictators played 20-plus dates over the course of the summer, the most since the “Bloodbrothers” tour in 1978. The first weekend on the road, 5/31 in Providence and 6/1 at the Channel in Boston, were much improved shows, but it still felt like they were playing it safe. The set lists were identical to those from the 1981 shows, and they still seemed tentative. They were still short-arming their throws. The Fast Lane show ended up being Richie Teeter’s last ever gig as a Dictator. 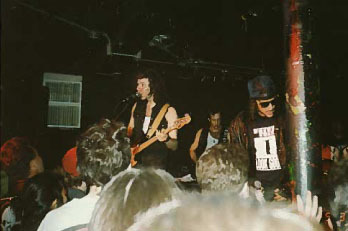 Frankie Funaro answered the call, and played the rest of the 1991 shows. Maybe it was the tumbleweed hairdo on Frank. Maybe it was the addition of the MWK catalog to the set. Maybe it was getting goosed by the Lunachicks, who were the support act for the tour. Maybe it was the tightness that comes with repetition. For whatever reason, the band had become a machine, and the balance of the 1991 shows were absolutely phenomenal. The energy level was off the charts, with oomph coming from the bottom end of the band as if it were rocket fueled. 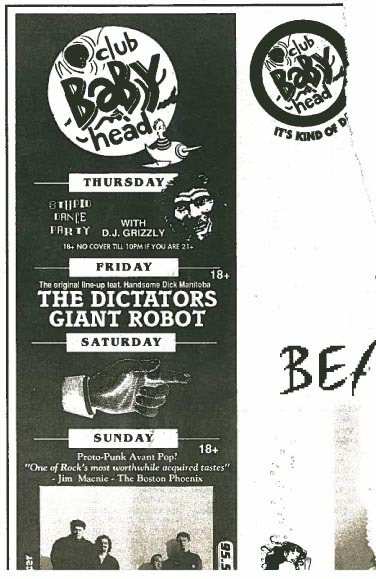 IMHO, these dozen or so 1991 shows this juggernaut played with Frank rank among the most powerful in the band’s history, with the Winnipeg show on 8/19 (“I’d like to thank you for naming your province after me!”) and the final show on NYC’s Marquee on Sept. 6 being the highlights among the highlights. This final leg of the tour is where the rebirth of The Dictators really began. 3. The Party Starts Now! 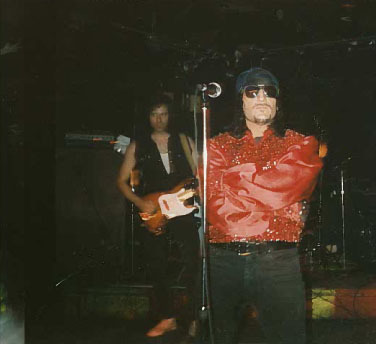 I saw The Dictators/Lunachicks/Spinout @ Tut’s (formerly the Quiet Knight), with Frank Funaro manning the cans. This gig was manna from heaven, who’da thunk The Dictators would ever come back Chicago? I snapped up the last Search & Destroy tour shirt available at the merch table. (I still have it here in 2018). The Dictators smoked like a tire fire! My love for the band’s music was rekindled that night, never to be extinguished. The club in question was The Avalon, the short-lived successor to Tut’s, which was previously The Quiet Knight.